They’re a well-oiled Where’s Waldo? Rube Goldberg machine of colourful lightening strewn with silk, soul and funk! They’re the Warhol painting you’ve never seen hanging on the bridge of a shimmering disco starship about to enter your atmosphere in rainbow warp drive. They are stardust. They are golden. There live shows are as bright and beaming as their outfits. Malak may be a newcomer on the local scene, but her voice shows a maturity beyond her years. Raised in Egypt, she’d venture to Greece, Italy and Germany before the eventual move to Canada collecting the music of each region like road maps in a glove compartment. 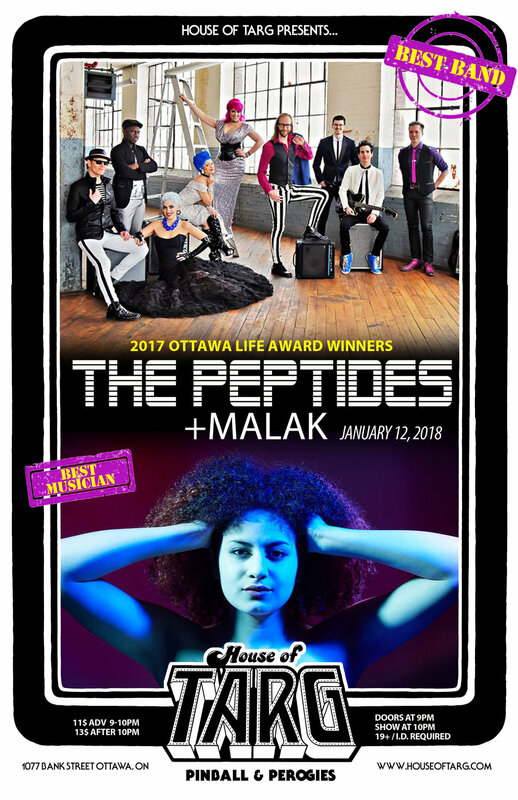 Malak has been raking in much acclaim usually by people who are simply blown away by the voice that rushes out of her. It's like ice on fire. That moment you first hear it is a kind of mix of elation and sadness because you realize you will never get to experience her for the first time again!